Recently, Lisa Klinghoffer e-mailed me about an important anniversary: the murder of her father, Leon Klinghoffer, by Islamic terrorists. 20 years ago, this past Saturday (October 8), Leon Klinghoffer–a helpless 69-year-old in a wheelchair on a cruise ship–was cruelly murdered for the dual crimes of being a Jew and an American. He and his wife were taking the cruise to celebrate their 36th wedding anniversary. After hijacking the ship, cowardly Palestinian terrorists assassinated Klinghoffer by gunshot and threw his body overboard, a plot masterminded by Abu Abbas. Unlike Klinghoffer, Abbas led a great life and was never punished. He was allowed to live in freedom–under the protection of Saddam Hussein in Iraq. He died in captivity shortly after U.S. troops captured him during the start of the War in Iraq. Abbas never faced justice. An Egyptian jet tried to fly the Islamic hijacker-murderers to freedom, but U.S. Navy F-14 fighters intercepted it and forced it to land in Sicily. Now, however, there is word–through an FBI informant (whom I represented)–that the U.S. government may have shamefully allowed one of Klinghoffer’s murderers to live in freedom in the Washington, DC area, under an assumed name–“in exchange for information on Al Qaeda.” No information is enough to justify freedom (or even life) for any of Klinghoffer’s murderers. Lisa is right. It’s not just that we haven’t remembered Klinghoffer and his murder with proper attention and resolve. It’s that in the 20 years since his murder, we have empowered radical Muslims and the terrorists they support–the same ones who murdered her innocent, disabled father and threw him overboard. And now we are being asked–in our schools, our popular culture, our government policy–to “understand” them. Klinghoffer’s murderers weren’t Christians. And they weren’t from Samoa or Fiji, either. They were Arab Muslims. The same group we keep denying is after us, today. Thank you so much! It has been a tough time for me this past week. We went to the cemetery and cried. I have tried to be so brave and stoic over the years and do the work that we do in Leon’s honor and memory. But sometimes, I just have “a moment,” and all families have to go through the same, as we do. Thanks for remembering. I mean that’s what it’s all about: to remember and to educate so that perhaps one day ………. 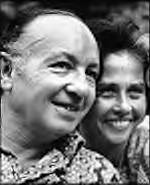 I’ve never forgotten Leon Klinghoffer, and that infamous day/incident aboard The Achille Lauro. I was 16 years old. I continue to be disgusted that we haven’t remembered Klinghoffer and his murder with proper attention. We haven’t done enough to erradicate the real problem; ISLAM! RADICAL ISLAM!! And all those that enable these sub-human terrorists. And yet we give millions every year to Palestine. The hijackers had been surprised by a crew member and acted prematurely. Holding the passengers and crew hostage, they directed the vessel to sail to Tartus, Syria, and demanded the release of 50 Palestinians then in Israeli prisons. Refused permission to dock at Tartus, the hijackers killed one wheelchair-bound passenger Ôø? 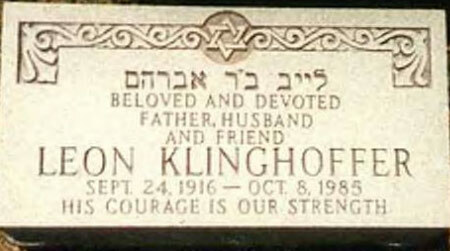 an American named Leon Klinghoffer Ôø? because he was Jewish and threw his body overboard. The ship headed back towards Port Said, and after two days of negotiations the hijackers agreed to abandon the liner for safe conduct and were flown towards Tunisia aboard an Egyptian commercial airliner. The plane was intercepted by United States Navy fighters on October 10 and directed to land at Naval Air Station Sigonella, a NATO base in Sicily, where the hijackers were arrested by the Italians after a disagreement between U.S. and Italian authorities. The other passengers on the plane (possibly including the hijackers’ leader Abu Abbas) were allowed to continue on to their destination, despite protests by the United States. Egypt demanded, but did not receive, an apology from the United States for forcing the airplane off course. If it weren’t for innocent women, children, and the physically impaired, gutless wonder Muslim punks would never win a battle. The MSM/DNC prefers to remain silent about this anniversary because it wants us to believe that terrorism began during the Presidency of George Bush – just like hurricanes. This can’t be true. We all know that terrorism did not begin until George Bush became President – just like hurricanes. Click here to learn how the American left treated the military heros who captured the terrorists. “sensitive terrorist”..I’m in the mood to run Adams over with a bulldozer-so a hit play can be done about him,like Rachel Corrie. The rotter who wrote that play should be a human shield for a while. Wow, 20 years, time really flies, guess I’m getting old (especially compared to Yiddish Steel :-)) (OK I was “only” 18 then….I remember the story vividly and how horrified I was by it). Thanks for the reminder Debbie, “never forget” and “never again”!